Date: Date the parent/guardian expressed an interest or identified a need for a particular service. This defaults to today’s date so be sure to update it if you are entering an event a few days later. Staff: Select the staff person who will make a referral or deliver the service. Housing assistance such as subsidies, utilities, repairs, etc. Referral Date: If the service will occur outside of your program, enter the date the referral was made. 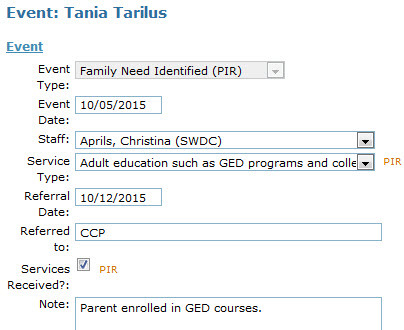 Referred To: Enter the individual or organization where the parent/guardian was referred. Services Received? : If the referral or identified need resulted in the family/individual receiving services, check this box. Note: Enter specific details here about the identified need, referral and service delivered. *Only family need identified events designated on primary and secondary contacts only will be included in the count under the Family Services section of the PIR (C.50).